While mass shootings at schools, entertainment venues, churches, and other gathering places regularly make national headlines, they represent only a small slice of America’s growing trend of gun violence. In fact, 54% of mass shootings (four or more victims) relate to domestic or family violence, often occurring in private residences. Furthermore, a full third (36%) of US gun deaths are homicides, but far more (62%) are suicides. While rates of other violent crimes steadily decrease, the number of gun homicides over the last fifteen years have increased, sparking a variety of responses from student walkouts to the President’s calls to arm teachers. The debate over gun control has been notoriously partisan for decades. Each state has separate laws governing who can purchase and own a handgun—and its own firearm death rate. 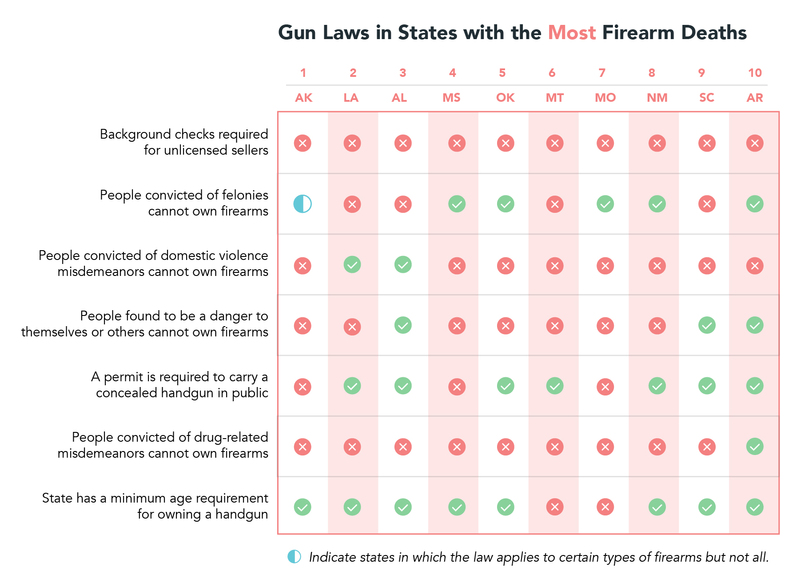 So which states have the best gun safety, and which fall short? To find out, we dove into the data and developed a list of the ten best and worst states for gun safety. 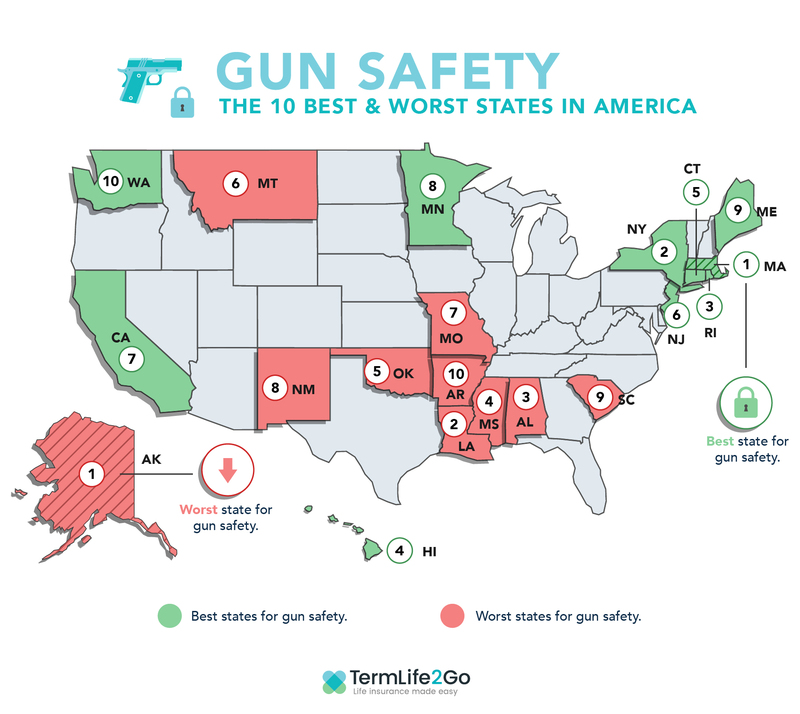 TermLife2Go analyzed the best and worst states for gun safety using five equally weighted ranking factors that include the number of firearm deaths per 100,000 people and four types of gun regulations. Since 34% of mass shootings involve a shooter prohibited from possessing a firearm, one regulation we considered was whether each state requires unlicensed sellers to run background checks. All states require background checks when people buy guns from licensed sellers, as per federal law. We also factored in whether a state generally prohibits people convicted of felonies or domestic violence, as well as those whose mental illness made them a danger to themselves or others, from possessing a gun. Both experts and much of the public support such measures. TermLife2Go used the most recent data available for all ranking factors; available state law data is current to 2018; the most recent statistics available on gun-related deaths, however, are from 2016. Six of the ten states with the lowest rate of registered weapons ranked in the top ten for overall gun safety—the rest ranked in the top twenty-five. All ten of the safest states had fewer than two registered weapons per 100,000 people. Most of the ten least safe states had more. All ten states with the lowest rate of firearm deaths had domestic violence and mental illness gun laws in place. None of the ten states with the highest rate of firearm deaths required criminal background checks for gun sales by unlicensed sellers. All top ten states for gun safety are blue states, and nine of the ten least safe are red states, with New Mexico sometimes considered a swing state. Oregon seems to be an outlier: the state has strict screening and possession laws and a low number of registered weapons but ranks near the middle for firearm deaths. Overall, states with stricter gun regulations had fewer gun-related deaths, making it clear that the right gun control laws can be effective in preventing gun-related violence. Still, no single kind of law seems to be a silver bullet for lower gun violence, so it’s likely that stemming the tide of gun violence will require multiple solutions, perhaps ones yet to be created. Another point worth considering? While the majority (63%) of gun owners cite protection as a reason for owning a gun, only an estimated 1,979 shootings in America involved self-defense in 2017. That’s just 0 .006 per 100,000 people. Could your state be more gun-safe? Absolutely. Even the top ten states have room for improvement. While our top states all came in at nine or fewer gun deaths per 100,000 people, a single shooting is one too many for the victims of those crimes. Learn more about the gun laws in your state at www.everytownresearch.org.